Visiting the Leaning Tower of Pisa in Italy. It’s sometimes a cliché in life to “tick off the major sights” but like a lot of other travellers, I do them too. 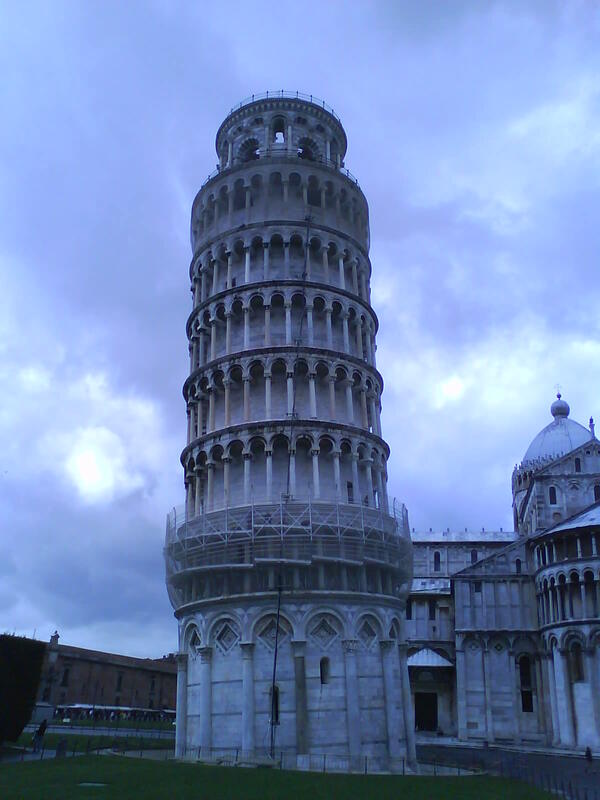 It would also seem a bit ludicrous to end up in Pisa in Italy, without actually visiting the Leaning Tower of Pisa. I was there, 4 years ago to the day, what’s it all about? It’s in the city of Pisa, Tuscany in Italy. 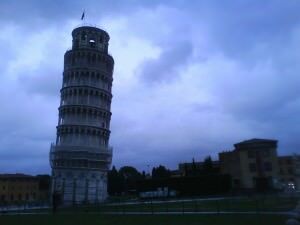 It’s not tall enough to be seen from anywhere in Pisa, but it’s also not too difficult to find, you’ll be glad to know. Unless you’re already nearby, it’s best reached by air. 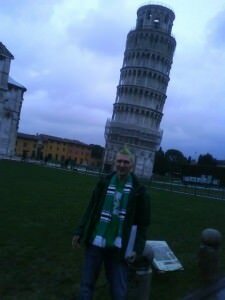 On my trip, I flew into Pisa airport (Galileo International Airport) by booking flights through city breaks as I lived in the UK at the time. I flew from London. 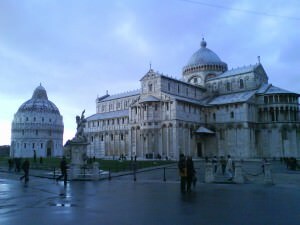 To get to the city centre from the airport is fairly easy – hop on a Red LAM line bus and it will actually drop you off close to the Leaning Tower itself. Getting to Pisa city centre from the airport is fast and straight forward – you will arrive near this walled entrance. Where to stay in Pisa? 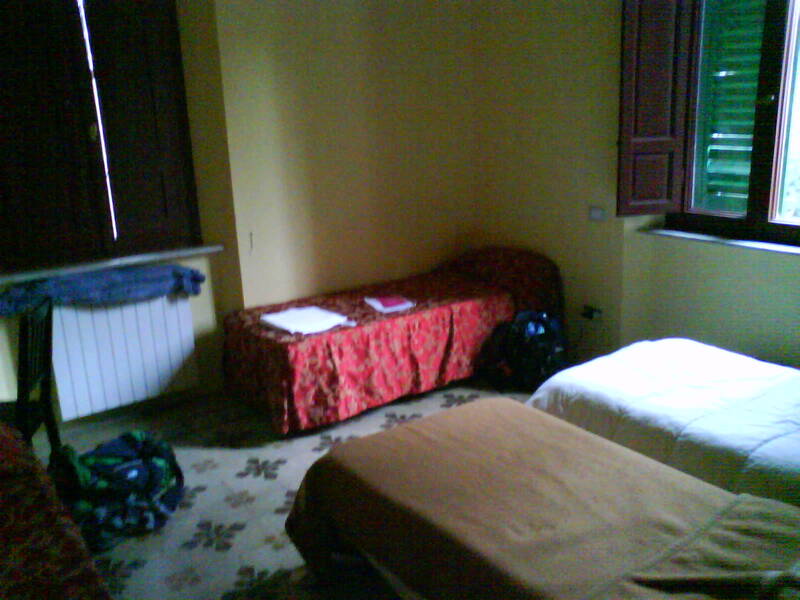 Our bedroom at the excellent Villa Leaning Tower – a great place to stay and close to the Leaning Tower of Pisa. It was totally NOT busy at all when I went (February 2009) so don’t be rushing to get up early and queue for it – you will be surprised that the entire sensation is done and dusted in less than an hour (honestly that’s all the time you need). 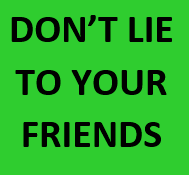 Unless of course you go in peak season (Summer) in which case there may be longer queues. Standing in front of the Leaning Tower of Pisa in the queue to go up. OH WAIT! It wasn’t busy and there was no queue! You will be searched on the way in and things will be confiscated for taking up to the top. 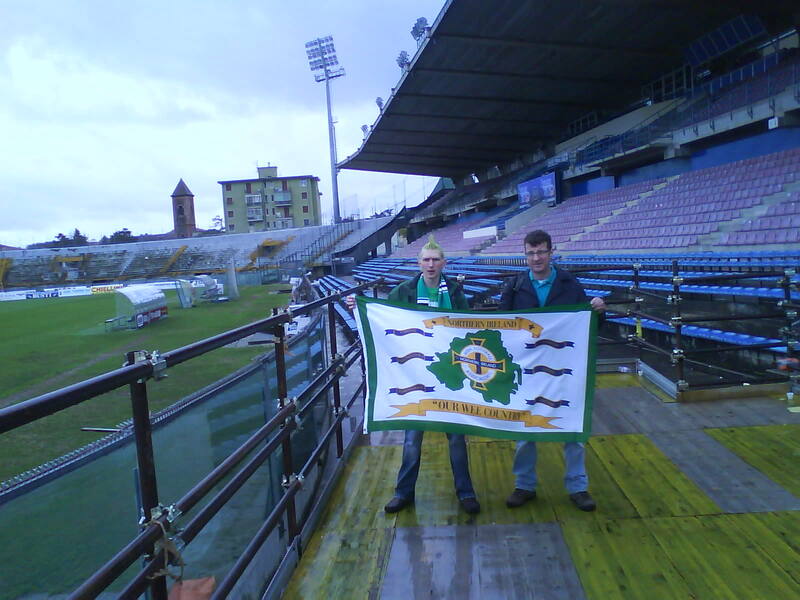 I was there with my travelling football mates and we smuggled a Northern Ireland flag to the top! Then some Italian Police Dude tried to ban us from flying it! 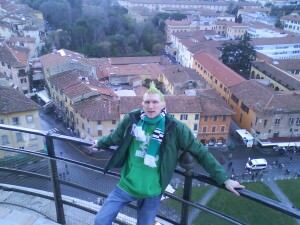 Enjoying the view from the excellent Leaning Tower of Pisa in Italy. Yes I had a green mohawk and was on a football trip with the lads! 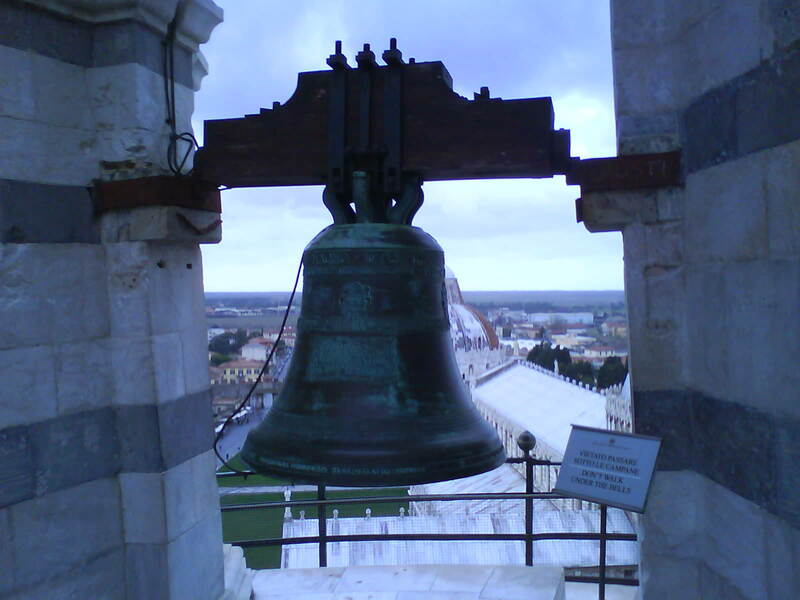 How much does it cost to go to the top of the Leaning Tower of Pisa? 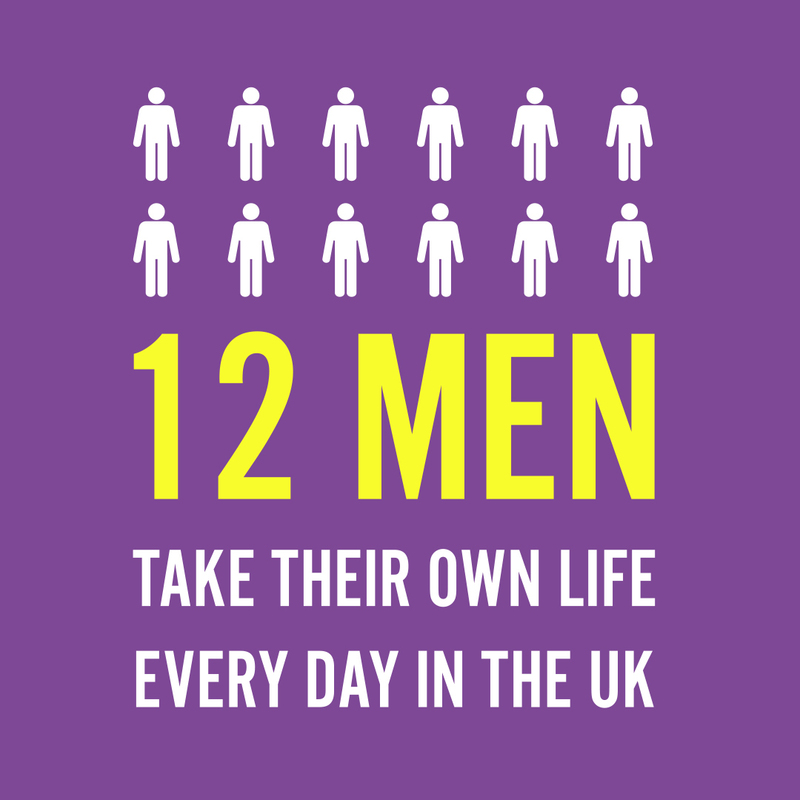 Good question, and since I went in 2009, my answer is out of date. I paid 5 Euros for the privilege and the entire event involved walking about about 300 steps, ringing a bell at the top, enjoying the view and walking back down. 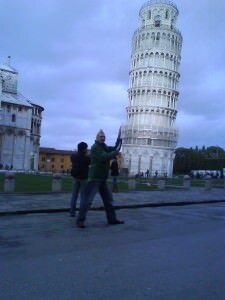 It’s taking me longer to write this post than the amount of time I spent inside the Leaning Tower of Pisa!!! The view from the top of the Leaning Tower of Pisa – I paid 5 Euros a few years back apparently it’s now 18 Euros! Ouch! The cost for you will apparently have gone up to 18 Euros!! I got this information from Tripadvisor on this link: Price of Leaning Tower Climb. This website seems to think you are better to buy a ticket in advance and that the tower gets busy: Weekend in Pisa but that’s not great advice to be honest – you can literally just turn up and buy your tickets and then walk straight up, you’ll also save money doing it this way!! The less than glamorous walk up to the Leaning Tower of Pisa. If they have changed the policy let me know, but I went there in 2009 and a friend went there last year and this was still the case. However I will tell you this: If the price really is 18 Euros and I had the chance to do it again, I wouldn’t go to the top – it’s just not worth that amount of money, in fact you can get a decent view of the city from a Church or a Hotel, you’re really only paying it to “say you’ve done it”. 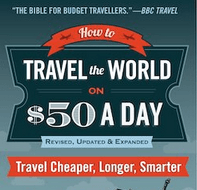 I don’t normally say “don’t do this” on my travel site, but this is expensive. That said, it’s a world famous monument and you won’t be here again 😉 If you’re not sure whether to pay that amount or not, my videos below give an idea of what it’s like. Is it worth paying 18 Euros to ring a bell and look down on a non-descript city?? Why is the Leaning Tower of Pisa tilted? It wasn’t meant to be that way you know! I learnt that a mistake during construction led to the slight tilt. The architects and builders noticed this as they were building it, but in true Italian style they just got on with the show without regret. The story is recounted on a video on the ground floor entrance to the tower itself and you can pick up a leaflet or guidebook if you need one. There have been attempts to rectify the tilt, but the city relies on it these days for tourism, so it’s worth promoting the tilt! It was tilted by mistake – in fact if you take a photo from the back you may not even notice the tilt. What else is there to do in Pisa? Visiting the Leaning Tower of Pisa is good, but it’s not the only thing to do. 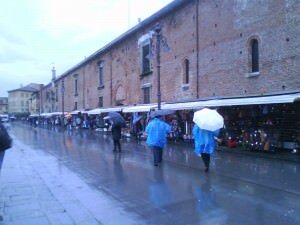 Pisa is actually quite a dull, dreary city but still it has some charm of course and the avid traveller can find joys anywhere, here’s four other things I did to give you a few tips. OK so football isn’t everyone’s cup of tea I admit, but the stadium is very close to the Leaning Tower and you can literally just wander on inside like we did!! It’s worth a look, this is a surprisingly large stadium for a small city. In Pisa you can pop inside the local football stadium for a look around, like myself and my travel buddy Graham did! 3. Eat Pizza in Pisa! 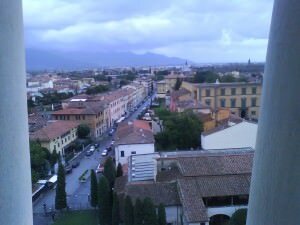 Come on – you’re in Italy and Pisa does Pizza well – there are countless restaurants to try that authentic Italian Pizza, some with an excellent views overlooking the square or the river. Also if I’m being honest, there’s not a great deal to actually do aside from the Leaning Tower, so eating and drinking are fab traveller’s alternatives! 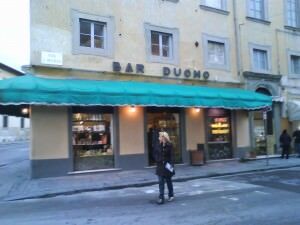 I ate at Bar Duomo (by the square) and Bazeel (by the river). When all else fails as a traveller, get yourself a few beers and party! 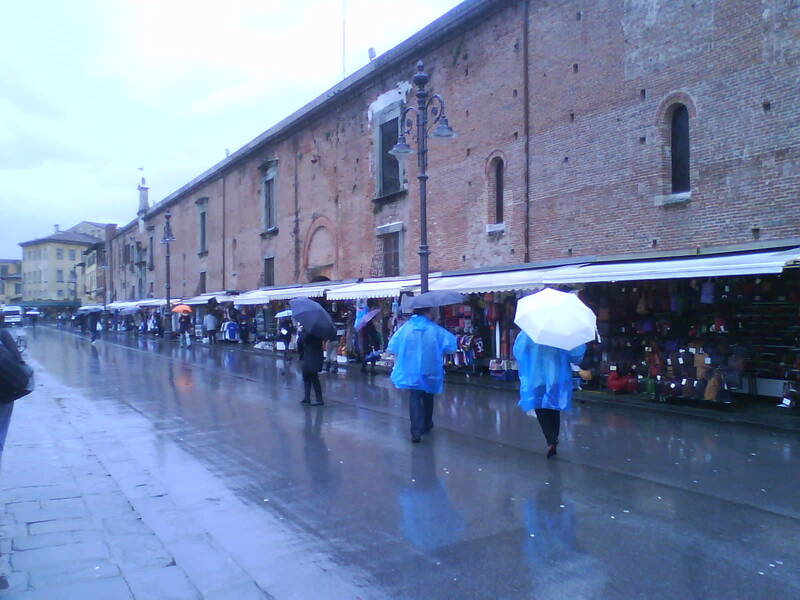 Pisa brings together a mix of locals, students, families and tourists. 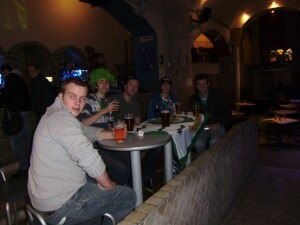 I enjoyed a great night out drinking there in the bars by the river. Bazeel is a decent bar as is the Irish Pub called Temple Bar, I was even pouring pints and drinking them behind the bar in Temple Bar just “because you’re Irish”. Well that’s actually it. The Leaning Tower of Pisa and a bit more for you on Don’t Stop Living – a lifestyle of travel. 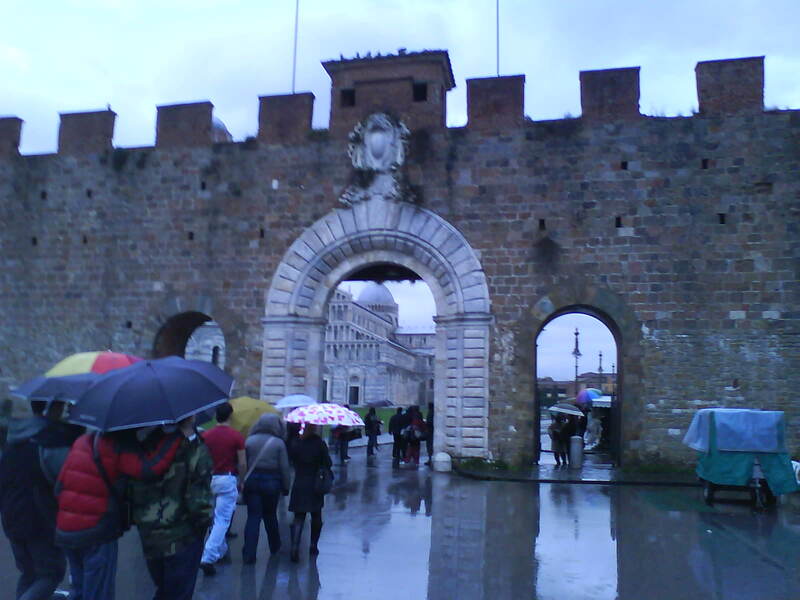 This entry was posted in Destinations, Europe, Italy, Lists, Pisa, World Heritage Sites and tagged Arno, Florence, Italy, Leaning Tower, Leaning Tower - Pisa, London, Pisa, Tuscany. Bookmark the permalink. Sir jonny,I would like to say thank you,because my interest in geography and travel fires up, I’m so impressed with all of your post here in your travel website, It’s really amazing!,, I wish I would be able to experience it.hehe. Sir,jonny,thank you so much for the response,One more question,regarding the Italian train going to Pisa, do you think it is alright,if I purchase a train ticket just on the day I’m going to Pisa?,like is it okey,to buy for a ticket without a prior reservation, because I’m planning to buy the ticket once I get at the train station,thank you so much in advance..
Sir jonny,thank you so much for your response,I’m glad you were able to answer my question,one more thing sir jonny,would it be alright,if I purchase my train ticket to Pisais by the time when I’m at the train station in Italy,I mean,would it be alright if I will not have a prior reservation in buying for my ticket to Pisa let’s say for instance.? ?.thank you so much..